Two weeks before he became president, President Elect Jovenel Moise already igniting a war. Standing before a crowd last Sunday in the city of Les Cayes, the National Carnival would be relocating this year from Port-au-Prince to Les Cayes. "The president has spoken. Period," Moïse declared. Former Haitian President Martelly, the "King of Carnival", is known as the political mentor of President Jovenel Moise. Martelly tapped Jovenel Moise to replace him. They both are in favor of locating the Carnival in Les Cayes while Mayor Youri Chevry wants it to be played in Port-au-Prince. Two weeks before Jovenel Moise became president, he almost ignited a war. 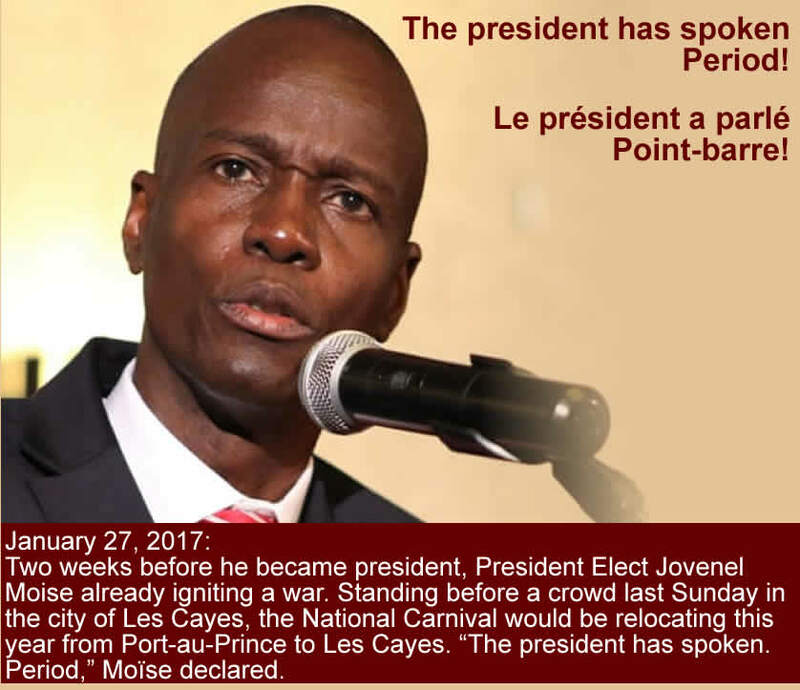 Standing before a crowd on January 22, 2017 in the city of Les Cayes, he announced, the National Carnival would be relocated this year from Port-au-Prince to Les Cayes. "The president has spoken. "Following the 2010 earthquake, then President Martelly announced that in 2012, the carnival will be moved and celebrated in Les Cayes. In less than a month, street stands were cleared away for the construction of a massive stadium viewing of the passing parade. The government sponsored music and colors of Kanaval were unparalleled. However, that 2012 National Carnival came under many allegations from different sections in Haitian society. It is still known as a tool for money laundering. The peculiarity of Mr. Moise's decision to personally placing own decision is that holding the celebration in Les Cayes ensures participation of only 0.7% of the Haitian population. Moreover, it was a time when then president elect Moise himself was under a scanner of money laundering. The investigation was launched by a January 13, 2017 referral to Port-au-Prince's district attorney by the Central Financial Intelligence Unit (UCREF). The unit operates at an international level to investigate possible financial crimes, and the Unit Combating Corruption (ULCC), is an institution working within the Haitian executive branch to formally file criminal complaints. In 2017, Haiti's government spent some $3 million on Carnival celebrations, hoping to lure tourists and Haitians living abroad. It is still unknown how much money the festivities actually generated in Les Cayes and its surrounding areas and encouraged the economic movement in the department after the passage of Hurricane Matthew. There are few hotels in Les Cayes while Port-au-Prince boasts more than 10,000 hotel rooms.